There are few tasks I dislike more than doing the dog’s nails. I know that it’s all a part of good dog ownership, but I hate it. Hate it like poison. I don’t think my dogs enjoy it any more than I do. In fact, I know they don’t. Nearly six years ago, we switched to the Dremel. Aside from some initial problems, our switch to the Dremel has been overwhelmingly positive. Dremeling dog nails allowed me much more control over how far I trim my dog’s nails. I never get them too short, the edges are nice and smooth (not sharp like cut nails can be) and the dogs don’t fight it as much as they do clippers. I have Fluffy Dog Problems. Even with how much easier the Dremel was, I was still scared as woof to use it – especially on Felix. You guys! That boy is SO FLUFFY. I was terrified that I would get his paw fur wrapped around the Dremel head at high speeds, pulling it and ripping it out. I swear he HAS nails. They’re just frequently hidden by his massive amounts of fluff. No joke, you guys. I got MY hair caught in it once and it was so painful! I would never forgive myself if I did that to Felix. Some interweb searching suggested that you could cover your dog’s paw in old pantyhose, but we didn’t have much success with that. A: I don’t WEAR pantyhose, so I had to go buy a pair especially to try (and those suckers aren’t cheap!) and B: it didn’t work. I ended up getting the pantyhose caught in the Dremel. It was better than getting Felix’s fur caught, but still, less than ideal. I knew there had to be a better way. Who knew the solution would be BABY SOCKS? Seriously folks. The pantyhose people were onto something great, but the idea just needed a bit of refining. I stumbled across the answer wandering the dollar store one day: baby socks. Small enough to fit snugly against the paw and made from an elasticy material to hold them on, Baby socks are the perfect way to keep your dog’s fur out of the way while you Dremel their nails. All I had to do was cut a small hole (or multiple holes) in the tip of the sock. I used Fray Check to keep the sock from unravelling. Once the Fray Check is dry, just slip the sock on your dog’s paw, poke their nail through the hole, one at a time and Dremel until short & smooth. Reward with lots of treats, kibbles and snacks. 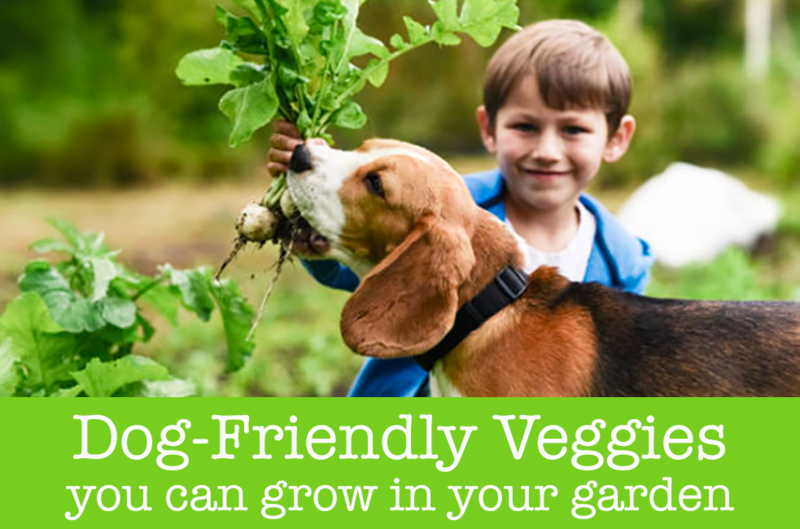 Do you have any tips to make cutting or dremelling dog nails easier? 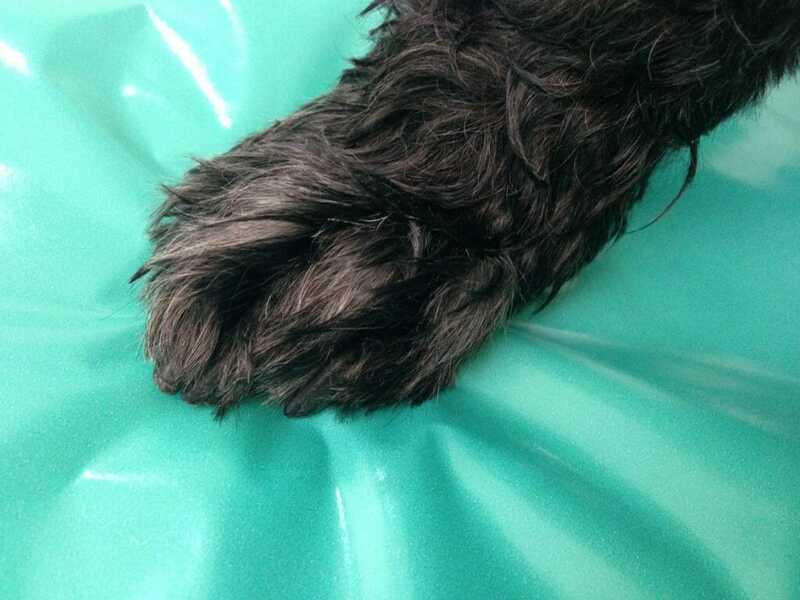 Thank you for this informative post about dremeling your dogs nails! Milo is so sensitive about getting his nails cut but you have inspired me to try again! Felix used to be very sensitive about it too – probably because I made the poor guy bleed so many times :/ We started doing one nail every day, with LOTS of treat and over time, Felix got used to it. These days, nails are MUCH easier. What a clever and oh-so-smart way to trim your dog’s nails!!! Color us impressed! Why thank you. I think Cat people are the impressive ones. I remember trying to trim our old cats nails and thinking it was like the impossible journey. LOL. Thank you Maureen 🙂 It was our amazing groomer who turned us onto it after noticing just how fearful Felix was of the clippers. It’s made things so much easier! Brave/Stubborn….those are similar things right? Our groomer is about 20 minutes away (but she’s amazing and Felix loves her, so we’ll never change.) We definitely had to find a way to keep his nails in check between hair appointments. Very resourceful! I don’t have fluffy dogs but I’m tempted to try it just because it keeps the nail you’re working on so visible and separate. One of the best tips I ever got for black nails was that the nail looks shiny when the grinding gets close to the blood supply. Thankfully I only have 6 black nails to deal with (4 on my girl, 2 on my boy) but that tip made it less scary to tackle them. I can totally see this helping a short haired dog – especially ones with little paws or that squirm to keep you from hitting other nails as you work. Great idea!! Baby socks – that’s genius! What a great idea. We keep baby socks in our doggie first aid kit; when our Husky got injured we cleaned & bandaged her cut, then we covered the dog bandage w/ a baby sock loosely taped around to prevent her from ripping off the bandage. I never realized a nail grinder could get caught in fluffy fur – ouch! Oh! I never thought about how useful they would be over a bandage. That’s a great idea. I’m going to add a pair to our first aid kit. Thank you Cathy! HACK! Ugh…where were you at 11:53 last night when I was trying to “Pinterest up” that image and I couldn’t FOR THE LIFE OF ME remember that word?! And thank you. Coming from someone as resourceful as yourself, I am truly flattered. What a fantastic idea! Sarah has black nails and “slipper feet” between grooms. I might actually be able to pull this off, but her feet may be too small for even baby socks. Fray Check??? I’m going to have to Google that one. I was NOT blessed with the craft gene. If you are even a litle crafty, you could make a smaller sock from felt or whatever sturdy fabric is in the markdown bin. Aah, I can see how that would be a challenge. We are still doing one nail a day with clippers. Not as pretty but it’s working. We started doing one nail a day, even with the dremel, but 2014 was a bang up year for Felix and we FINALLY resolved a lot of his anxiety. These days, I can usually get a whole paw done in a single setting or on days when he’s really tired, TWO! Slow but steady wins the race. I’m sure the pups appreciate your patience! What a brilliant idea! We still use guillotine clippers when I am brave enough to clip Luna’s nails myself. Fortunately, she has a few white nails so I can kind of base the black ones on those. We tried something like the Dremel once and she was terrified of the sound. She wouldn’t even sit still to do one nail, so I gave up. It took us…3 months of NOT using the dremel before we could use it? I used to sit it on end tables, the couch etc until Fe wan’t afraid of IT. Then I would smear PB on it until he actually liked it. Then I would turn it ON, but not go anywhere near him, then I would leave a trail of super high value treats from his bed to me while I had it on. Then I would let him lick one of our “peanut butter walls” while I did his back nails…and then, we did one nail at a time for another three months or so. Seriously. You can’t even make that kind of ridiculousness up. Brilliant! I so wish I’d had this when my dog Bugsy was still around. What a great simple solution. And I love the dremel for nail trimming it’s so much nicer! I love the dremel too.What kind of dog was Bugsy? I love the name! That idea is brilliant! I use regular clippers on Mauja and Atka because of their long fur. They also have white nails, which makes it MUCH easier. Our first dog had a mix of black and white nails. The black ones were a PAIN to cut. I am always SO AFRAID. LOL, dark nails are the worst, but I never have white fur on my black dress pants. Everything in life is a trade off, right? Now that is a useful tip! You can also use nail polish to keep the sock from fraying. My sisters and I all have lots of foot fur and it has gotten tangled, so this is awesome! Nail polish! 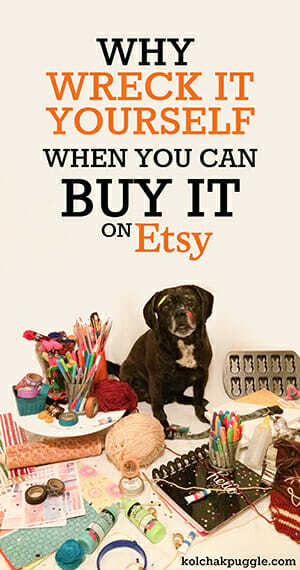 That’s a fantastic idea, especially if you aren’t a crazy sewing nut like me who just keeps Fray Check in the house. What a great idea. My dogs all have dark nails and I hate clipping them, too. I bought a Dremel but have been afraid to use it. This hint may be the key! 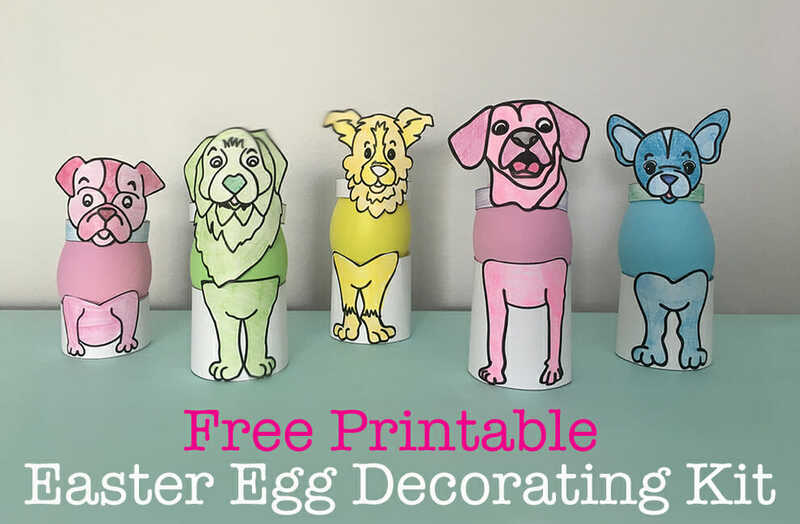 Very clever idea, you crafty dog mom! Great solution! Us fuzzy long haired dogs kinda cringe when the toe nail skinny thing comes out! I don’t blame you guys ONE BIT. I got my hair caught in one once and I would never want to do that to my poor fluffy dog! That’s brilliant! I’m thinking you did actually spend a couple of minutes picking the colour and style of socks? Ha ha, super cute. I *might* have rummaged around to get the ones with turquoise on them. This is genius!!! Why didn’t my humans think of this!!! Even with a regular nail clipper my hair is stuck in!!! Thank you so much for sharing! Well isn’t that the cleverist thing I’ve read in a long time. 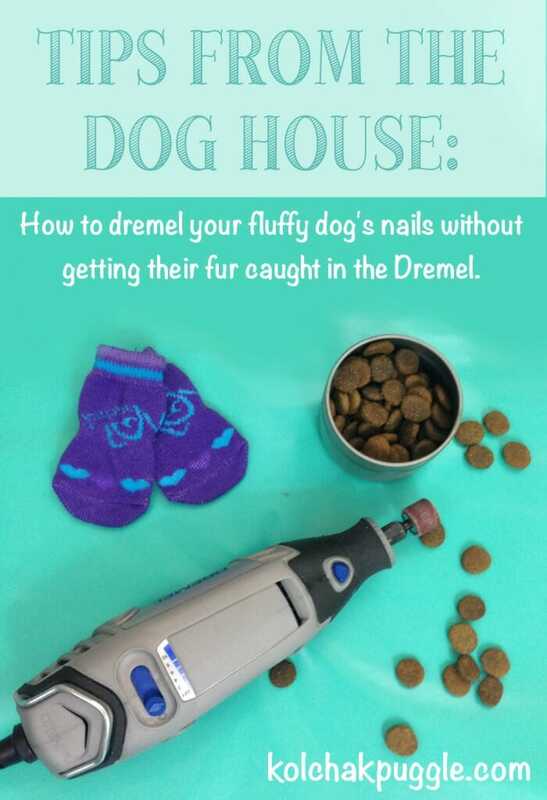 I had no idea you could dremel dogs’ nails so I learned two things! You absolutely can! The dremel gets hot fast, so you’re only supposed to touch it to your dog’s nails for a few second at a time to keep from overheating the nail. It’s great for regular maintenance, but it wouldn’t be great for trimming nails that are too long or need a lot taken off. My cats are great about nail clipping, but Dremeling…even they have their limits. But I love the baby sock technique and will share your post with my doggie friends! The last two dogs I had, over the course of 14 years, my vet did their nails for free every month. Now that I’ve moved, I’m going to have to start doing my newest dog’s nails myself. I am not thrilled! I’ll remember your tips! What a cool idea. I have heard of using pantyhose, but this sounds like it would work so much better. What a great idea! Don’t you just love it when you find a unique and simple solution to a problem? I’ve wondered about using the dremel toy on Haley’s nails, maybe I should give it a try! I tried the sock but now I just grab a small baggie–pop a hole for the nail I am working on then wrap the baggie around the rest of the paw–it works! Took a long time but I finally got my girl happy with the dremel–lots of treats!